Celebrate Singapore Aviation history with AirUtopia! Multiple military aircraft are joined by the first ever flying display of the Airbus A380 Super Jumbo in full Singapore Airlines livery! We also take a rare opportunity to enter an operational UAV control room and are given an exclusive tour of these unmanned warbirds of the future! 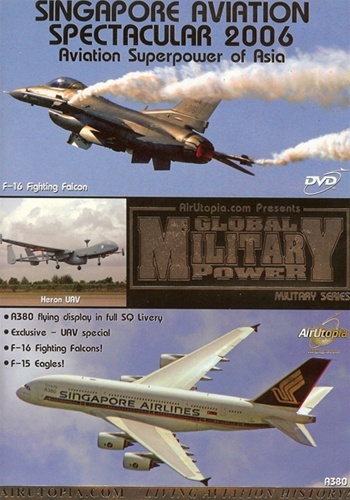 INCLUDES FIREPOWER OF THE US MILITARY, SINGAPORE, ITALY, AND MORE! F-16 Fighting Falcons & F-15 Eagles! Run time for this Singapore airshow video is about 80 minutes. Format is NTSC DVD and region-free.